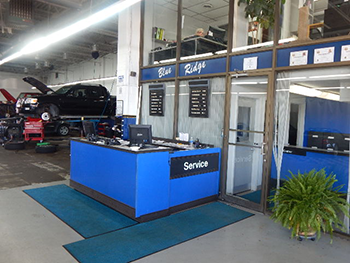 Welcome to Blue Ridge Autos; your home for the best automotive service and support in Kansas City. Whether you are in need of a major repair or just a routine tune-up, there is no denying that our team of dedicated and certified mechanics are ready to handle anything that comes their way. Our automotive technicians have years of experience handling repairs and maintenance from virtually every manufacturer, so you can take comfort knowing that these seasoned professionals are definitely up to the task of restoring all vehicles, both foreign and domestic. Before you consider any other option, take a moment to join us and learn a little bit more about why Blue Ridge Autos stands as the most trusted and reputable provider of automotive service in the Kansas City area. After doing this, we have no doubts that you will be ready to make the right choice when it comes to getting the most out of your service requirements and extending the useful life of your favorite car, truck, or sport utility vehicle (SUV) by as much as possible. Why Should I Schedule My Service at Blue Ridge Autos? A Commitment to Excellence and Safety – The Blue Ridge Autos team takes your safety seriously, so you can drive away from our dealership confident in the fact that your repair or scheduled service was done right the first time. Prices That Leave the Competition in Awe – Not interested in paying an arm and a leg for your upcoming service? Then come to Blue Ridge Autos and it will not take you long to see just how serious we are when it comes to keeping you on budget. Access to the Finest Replacement Parts – We have access to virtually any part needed to wrap up the job on your car's service, so getting your car up and running in a hurry is always a breeze. As you can see, Blue Ridge Autos is more than capable of setting the gold standard for the service and support of customers in Kansas City MO as they work toward getting their cars back on the road and in driving condition. Going a step further, Blue Ridge Autos is not just the most affordable and reliable service provider in town, but also the home to the most skilled assortment of certified mechanics. While having access to these trained experts might not seem all that impressive initially, the big thing to keep in mind is that these professionals have skills and training that easily supersede anything that you will find at other local or regional repair shops. Yes, these small-time operations might talk a big game and leverage clever sales tactics from time to time. However, the truth of matter is that only certified automotive technicians have spent the countless hours necessary to receive this honored designation. Additionally, achieving this status also comes with the ability to tap directly into our network of manufacturers and stay abreast of all of the latest news and insight into proper repair and maintenance procedures. When it comes to making sure your car is able to take the road safely and reliably, are you really prepared to accept anything less than the quality and elevated standards that come with labor undertaken by the certified auto mechanics found here at Blue Ridge Autos? Oil Changes – Failing to regularly change your oil is an easy way to wear away the vital parts of your engine via a lack of lubrication. Tire Rotations – Bald spots and avoidable wear and tear, as well as an increased risk for accidents, are all symptoms of tires that are not regularly rotated. Timing Belt Changes – A neglected timing belt is much like a ticking time bomb in that it can cause severe damage to your engine if it reaches the point of serious degradation and fails during your daily drive. Brake Inspections – While brakes might seem boring, inspecting these vital components on a regular basis ensures that they are ready to work properly when you need them most. Naturally, these are just a few examples of why neglecting routine maintenance is never a smart call. The health of your vehicle is on the line, so make it a point to connect with Blue Ridge Autos when the time comes to handle these often simple services. Between the friendly smiles and years of experience found within our staff, we have no doubts that these dedicated service professionals are more than equipped to handle any service or repair-related issue that comes your way.